Divinity is aimed at humanity. O trinity, you are music, you are life. All of creation is a symphony of the Holy Spirit which is joy and jubilation. The more one learns about that which one knows nothing of, the more one gains in wisdom. I, a mere female and fragile vessel, speak these things not from me but from a serene Light. The soul that is full of wisdom is saturated with the spray of a bubbling fountain - God himself. 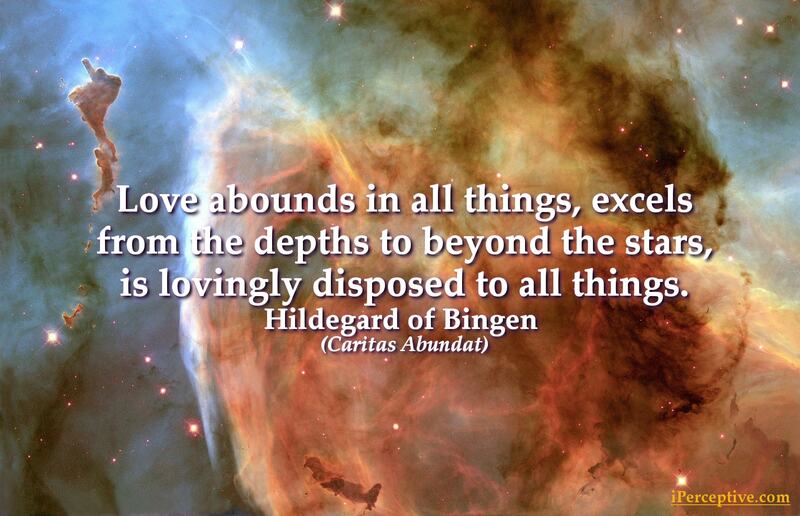 Love abounds in all things, excels from the depths to beyond the stars, is lovingly disposed to all things. May my voice never fall into forgetfulness among you;	may it rather be heard often in the midst of your love. Who can obscure the Beginning and the End, Who is, was and will remain? And what are you, who area spark among ashes? And what did you know when you were nothing? The marvels of God are not brought forth from one's self. Rather, it is more like a chord, a sound that is played. The tone does not come out of the chord itself, but rather, through the touch of the Musician. 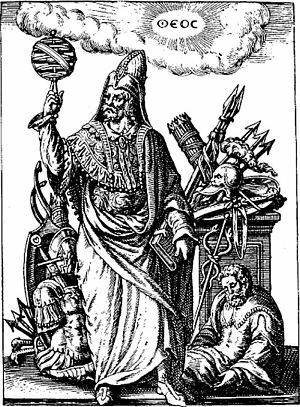 I am, of course, the lyre and harp of God's kindness. be pure in his sight. The earth should not be injured. The earth should not be destroyed. I, the fiery life of divine essence, am aflame beyond the beauty of the meadows. I gleam in the waters. I burn in the sun, moon, and stars. With every breeze, as with invisible life that contains everything, I awaken everything to life. I am the breeze that nurtures all things green. I encourage blossoms to flourish with ripening fruits. I am the rain coming from the dew that causes the grasses to laugh with the joy of life. The devil keeps man from good with a thousand machinations spewed from his belly, so that when a person sighs to do good, he pierces him with his shafts; and when he desires to embrace God with his whole heart in love, he subjects him to poisonous tribulations, seeking to pervert good work before God. And when a person seeks the viridity of virtue, the devil tells him that he does not know what he is doing, and he teaches him that he can set his own law for himself. its vigor returns to its own source. This is the underlying natural law. and their fruit is gathered back to God. your way of knowing is amazing! and see all your works gazing back at you. to be awake inside your breathing. and lead us to the joy of your salvation. 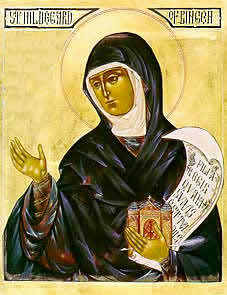 Hildegard of Bingen was a prominent German Christian mystic, polymath and abbess during the Middle Ages. 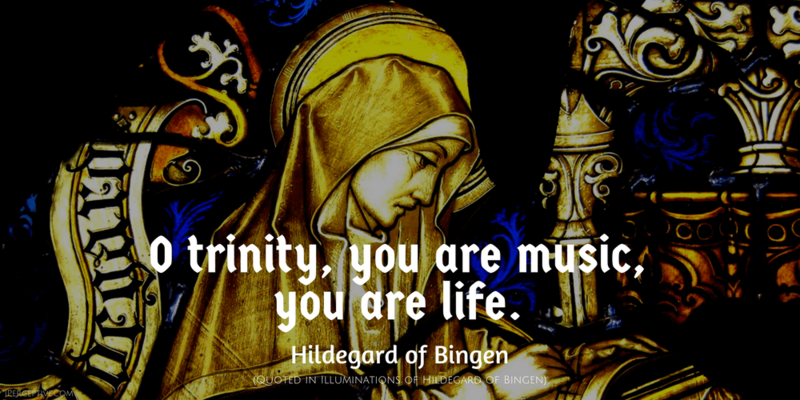 She is also known as Saint Hildegard and is known for her visionary theology and her subsequent great influence on Christianity.